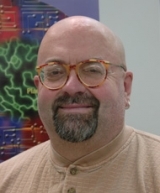 Systems biology is a relatively recent term, and can be considered as an amalgam of "functional-omics" data and computational biology. While primarily descriptive as the system is developed, it then evolves to predictive as the system is increasingly defined. The ultimate goal is an integrative model that approaches the in silico organism. A major focus of systems research in the Miernyk lab is soybean seed development. A descriptive platform has been developed that encompasses eight stages, and defines the periods of cell division/tissue differentiation, cellular specialization, lipid accumulation, protein accumulation, and preparation for quiescence. Total proteins were isolated from each stage and compared by Difference Gel Electrophoresis (DIGE). The patterns of change in protein abundance were analyzed by a combination of model-building, cluster analysis, and multidimensional scaling. Systems cartography is being used to describe the relationships among protein function, expression, localization, and biological interaction. The cartograph is constantly evolving, in all dimensions, as additional data are included. Figure Legend: Analysis of soybean seed proteins by Difference Gel Electrophoresis (DIGE) to identify targets for further analysis. The image is a comparison of proteins from stage S2 (labeled with CyDye3; Amersham) versus stage S3 (CyDye5-labeled). 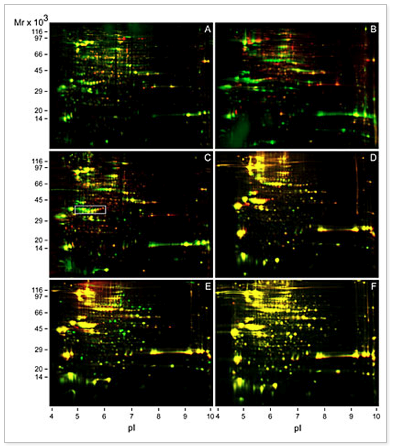 When the gels are imaged, spots that are relatively similar in protein abundance appear yellow, spots where protein abundance is increased in the second sample appear green, and those where protein abundance decreased appear red. Similar pairwise comparisons were made throughout seed development. Selected spots were subjected to in gel tryptic digestion, and peptide mass fingerprint analysis by MALDI-TOF mass spectrometry. Panel A, S2 v. S3; B, S3 v. S4; C, S4 v. S5; etc. The positions of marker protein migration are indicated to the left of the Y-axes; an estimate of the pI is indicated below the X-axes. The glycinin storage proteins are boxed in panel C.
Casteel J, Miernyk JA, and Thelen JJ. Mapping the lipoylation site of Arabidopsis thaliana plastidial dihydrolipoamide S-acetyltransferase using mass spectrometry and site-directed mutagenesis. Plant Physiology and Biochemistry, . Article in Press. Lewandowska-Gnatowska E, Johnston ML, Antoine W, Szczegielniak J, Muszy?ska G, and Miernyk JA. Using multiplex-staining to study changes in the maize leaf phosphoproteome in response to mechanical wounding. Phytochemistry 2011;72(10):1285-1292. Skultety L, Hajduch M, Flores-Ramirez G, Miernyk JA, Ciampor F, Toman R, and Sekeyova Z. Proteomic comparison of virulent phase I and avirulent phase II of Coxiella burnetii, the causative agent of Q fever. Journal of Proteomics, . Article in Press. Hajduch M, Hearne LB, Miernyk JA, Casteel JE, Joshi T, Agrawal GK, Song Z, Zhou M, Xu D, Thelen JJ. Systems analysis of seed filling in Arabidopsis: Using general linear modeling to assess concordance of transcript and protein expression. Plant Physiology 2010;152(4):2078-2087. Klubicova K, Bercak M, Danchenko M, Skultety L, Rashydov NM, Berezhna VV, Miernyk JA and Hajduch M. Agricultural recovery of a formerly radioactive area: I. Establishment of high-resolution quantitative protein map of mature flax seeds harvested from the remediated Chernobyl area. Phytochemistry 2010 (in press). Miernyk JA, Pretova A, Olmedilla A, Klubicova K, Obert B and Hajduch M. Using proteomics to study sexual reproduction in angiosperms. Sexual Plant Reproduction 2010;(in press). Klubicova K, Danchenko M, Skultety L, Miernyk JA, Rashydov NM, Berezhna VV, Pretaova A and Hajduch M. Proteomics analysis of flax grown in Chernobyl area suggests limited effect of contaminated environment on seed proteome. Environmental Science and Technology 2010;44(18):6940-6946. Huang Y, Houston NL, Tovar-Mendez A, Stevenson SE, Miernyk JA, Randall DD, and Thelen JJ. A quantitative mass spectrometry-based approach for identifying protein kinase clients and quantifying kinase activity. Analytical Biochemistry 2010;402(1):69-76. Miernyk JA and Thelen JJ. Biochemical approaches for discovering protein: protein interactions. Plant Journal 2008;53;597-609. Antoine W and Miernyk JA. Shape-to-string mapping: A novel approach to clustering time-index biomics data. Online Journal of Bioinformatics 2007;8:139-153. Miernyk JA, Szurmak B, Tovar-Mendez A, Randall DD, and Muszynska G. Is there a signal transduction pathway that links events at the plasma membrane to the phosphorylation state of the mitochondrial pyruvate dehydrogenase complex? Physiologia Plantarum 2007;129:104-113. Kojima M, Casteel J, Miernyk JA, and Thelen JJ. The effects of down-regulating expression of Arabidopsis thaliana membrane-associated acyl-CoA binding protein 2 on acyl-lipid composition. Plant Science 2007;172:36-44. Mooney BP, Miernyk JA, Greenlief MC, Thelen JJ. Using quantitative proteomics to predict metabolic activity. Physiologia Plantarum 128: 237-250. Miernyk JA, Johnston ML (2006) Chemical cross-linking immobilized-concanavalin A for use in proteomic analyses. Preparative Biochemistry and Biotechnology 2006;36:203-213.